I work as a part-time gynecologist. I hope to provide safe and secure medical care in order to assist you in conceiving and giving birth as early as possible, while fully understanding your feelings. I am a part-time gynecologist. I hope to assist you in graduating from this clinic in the near future with a smile. Communication between a couple is important. If you have any concerns and questions, do not hesitate to ask. I am Koichi Nagao, a urology professor at the Faculty of Medicine, Toho University. Are women the only ones who need infertility treatment? 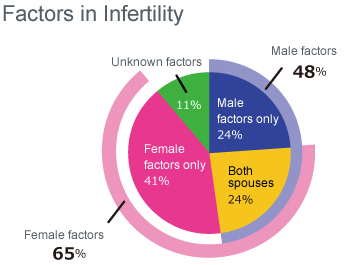 The fact is that nearly half of infertility problems are due to male factors. It is important to receive treatment together as a couple. There are treatments which can improve the quality of sperm. There are leading-edge medical techniques for azoospermia as well. At this clinic, urology treatment is provided by a specialist in reproductive medicine who has been board-certified by the Japan Society for Reproductive Medicine.